Road Trail Run: Racer Stories: Travelers Beer New England Half Marathon. Nike Zoom VaporFly 4% Takes Me To A 9 year Personal Best ! Racer Stories: Travelers Beer New England Half Marathon. Nike Zoom VaporFly 4% Takes Me To A 9 year Personal Best ! Sunday October 1st I ran the Traveler's Beer Half Marathon, a point to point course from the New Hampshire International Speedway to the New Hampshire State House in Concord. I ran 1:35.24 my fastest half within a few seconds in the last 10 years. I won the 60 and over age group after dueling the eventual second place finisher for 4 miles. The course has a net 230 foot drop with 436 feet of climbing on the way down. It included about 9.5 miles or so of beautiful country roads including a couple of miles of dirt, well shaded from the bright sun on a perfect weather day for running with about 40 Fahrenheit (5 C) at the start and mid 50's (12 C) at the finish. We were bused out in the fog from in front of the gold domed granite NH Statehouse, watched over statutes of the famous NH statesman and orator Daniel Webster and the NH's only president Franklin Pierce, a not quite as memorable character as Daniel Webster..
We started at the Speedway but unlike Nike Breaking 2 we did not lap the oval. The one mile oval would have gotten boring pretty quick. The track seats 110,000 and the week before hosted a NASCAR race. The weekend before there were up to 110,000 Nascar fans were in the stands behind me. Sunday, one solitary race car practicing and not a soul beyond a few runners checking out the infield. I went out about 10 seconds per mile slower than the last time I ran the race in 2014. I was not optimistic I would run faster or close to my time then, 1:36 on a warm day as my season to date had been mediocre. I was hoping for sub 1:40. Last weekend I ran the Lone Gull 10K, averaging 7:36 miles on a very humid day. In 2014 I ran Lone Gull right at 7:00 pace so prospects weren't promising although the weather was great for running Sunday and I had VaporFly on! I noticed a "gray haired" gent at the start up near the front with me and figured he was in my age group. He went out very fast and pretty soon was barely in sight. I thought he was long gone.. As we hit the hills and they were fairly big but the kind I like, steep on the way up more gradual on the way down, I started closing on him. I felt good and smooth. The Nike VaporFly 4%, more on then later, were a huge factor, very smooth and fluid running on the flatter sections well cushioned on the downhills and climbing decently. I was very surprised at 5K that I went through in 22:18 and at 10K I went through in 44:35 (7:10 pace) so very even despite all the hills and close to 3 minutes faster than the week before's race. My heart rate despite issues with both my watches (more on the watches below) early in the race was low for the pace. With 4 miles to go I had closed on my rival and stayed on his heels for a bit then, passed him in the downhill 11th mile. He stayed on my heels for a mile then as we went up a very sharp short hill on the bike path to cross the interstate he fell back. I pushed the next flatter section knowing there was another steep short climb at 11.5 miles. I then pushed on the gradual up hill 1.5 miles to the finish stretch and beat him in by 20 seconds to finish in 1:35.24, 7:17 pace. While I ran 7:04 pace at a totally downhill, and lots of it 10K, in Utah this summer my other 10K were all at 7:17 pace or worse this year my halves in the spring even worse, I have to go back to 2008 for a faster half barely, 1:35.05 on a totally flat course. This was a very good race for me, and in some ways unexpected.. The weather was perfect and this is a fast course for sure as I ran my fastest previous recent time there, 1:36 in 2014. But, there is more I believe. The Vapor Fly 4% (read my review here) was huge for me today. This was the first half I have run in Nike's premier distance racer, a pricey hard to get $250 6.8 oz marvel of light weight, superb cushion and response It's near version of the shoe worn for Nike's Breaking 2 project and on the feet of the recent Berlin winner the incomparable Kipchoge. But how about for an old mid packer like me? My conclusion after to today's race is that it is the ultimate racing shoe to date. 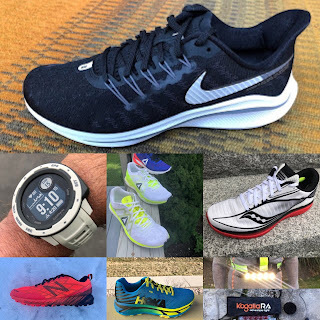 The big story for me and key to my good race was the Nike Zoom Vaporfly 4% (RTR review here). I am lucky to be able to test and review just about every training and race shoe and at the present time there is nothing close for me to this incredible shoe. At all times during the race, I had for all intents and purposes zero shock and no vibration, fast decisive response and comfort from the well held yet roomy upper. As I have seen in other races in them, my legs are just not as beat up during and after the race. I was able to challenge and move away from my rival in the last miles with relative ease. I did not throw down a huge kick my last miles being my slowest but I was under total control if a bit wobbly, that pointy narrow heel landing my only issue with VaporFly. The VaporFly 4% cushion was outstanding: not to soft in the heel, as I find the Zoom Elite is or overly harsh and firm as the Nike Zoom Streak 6 and most race flats has and is perfect in the forefoot with a soft landing with the foot then meeting the carbon plate just above the outsole for instant response at the right moment. At 50 miles on my VaporFly, I am finding the cushion slightly less marshmallowy than when new, more responsive. The VaporFly sets the bar very high and is a game changer for competitive runners of all paces and not just the top elites. The comfort was outstanding the whole race and I could easily push the pace as I wished. Runners who say not having tried it that it may not be as responsive as a firm "race flat" for longer distance races are in for a big surprise, a fast shoe that doesn't trash your legs. My legs were fresh in the last miles and ready to shift pace and challenge my rival. Those that say the "skin" which instead of outsole is at the heel is a big issue have as I found an easy solution After the first 10 miles or so I have used Shoe Goo at the heel wear points and all wear there has stopped. 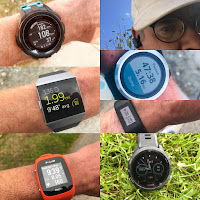 I wore a Garmin Forerunner 935 (see my review here) on one wrist and the new Fitbit Ionic on the other (see my review here which I will update). The Garmin was on my dominant right wrist and registered very low heart rates, incorrect, for the first 14 minutes of the race then settled in. This is likely due to the cool weather and lower blood flow until warmed up and I have seen this before but it was unusually long. It also displayed very high heart rate, incorrect, for the first mile then dropping to normal levels before plunging back down to overly low readings for miles 2 through 10 after which it found its way... I had not seen such discrepancies to date. It seems the colder air and the fast pace without much warm up are a factor. The Ionic's race day performance was disappointing and I will be retesting to see if I can break the heart rate and pace again. I had not experienced such issues to date in the warmer temperatures I had tested Ionic to date. Regardless, my main strategy with 2 watches was to use the Fitbit as a backup with primary purpose to display elapsed time on its super visible screen for quick mental calculation at mile markers while the Garmin displayed heart rate, average pace, and lap pace. All of this worked perfectly. I never touched any buttons. Given the cool temperatures I decided to wear a CoolCore t-shirt (article here). Wait you say a cooling shirt on a cool day... Well yes, as the main advantage of CoolCore is its moisture management and then rapid evaporation in all temperatures and its lack of wet cling. Comfort was incredible as we ran from very bright sun into deep shade continuously. As of now the most comfortable and effective run apparel available. Under an old pair of Salomon S/Lab shorts I wore Salomon's S-Lab New Support Half Tight , part of a modular system of inner short of 3 types, outer short,and belt. Without going into all the details... to date I have had zero chafe in these shorts, perfect temperature regulation and subtle yet effective support from the bands laminated to the inside of the shorts to provide kineso tape type support. They also have 2 stretch pockets, one on each hip than can easily swallow an iPhone 7 whole. What a great day for running and I am thrilled to have run a decent time. I highly recommend the Travelers Beer New England Half Marathon, a fast scenic course at the right time of year for fast times and impeccable organization. Instead of a t-shirt Millennium Running, the organizers, gave each of us a nice fleece. I gave mine to a homeless or near homeless fellow in a wheel chair near the finish line. The VaporFly,Coolcore, Garmin, and Fitbit were provided at no cost. All others mentioned were personal purchases. The opinions herein are entirely the authors'. Any word on wear the Vaporflys are being sold? RunningWarehouse search bar comes up blank....? Hearing VaporFly may be back in stock late October. Is that a Stryd on the left foot? If so, why not disregard pace (especially because it was malfunctioning) and run on power? Good eyes! Yes it is a Stryd. At the time of the race I was just starting to use, had only a few days before of data and did not have threshold power figure and had not done a test for it yet or much experience. The race did generate a threshold power figure which I am now starting to consider. What wasn't working was pace and HR on the Ionic, and for a period on the 935 as well but there just HR for the first 14 minutes. Each mile marker was prominently marked and as I was close to 7 min/miles I referred to the clock until things settled down with HR. In the future I will be looking at both power and heart as well as average and lap pace as I race and when appropriate in training. On most easier training runs I keep to the high end of aerobic HR (Maffetone) and am very familiar what that number is. Good stuff, thanks for the reply. That's all useful to me as I consider getting into power for running and nothing seems to be up to Stryd's level (and Garmin's at temp seems poor at best).